It is about 25 minutes by train. From the Kyoto Station, take the Kyoto Subway Karasuma Line traveling to Kokusai Kaikan. At the Karasuma Oike Stn, change the train to the Subway Tozai Line traveling to Rokujizo. Get off at Sanjo Station. 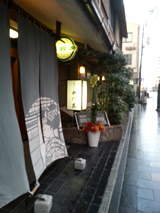 Leave via Exit 1 and walk about 50 meters east along Sanjyo St until you reach the intersection. Take a right onto Hanamikoji St., then walk about 200 meters south. 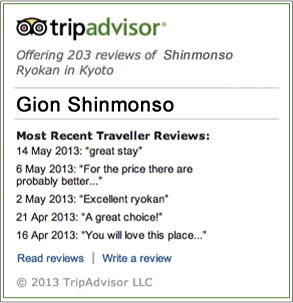 You will see " Gion Shinmonso " on your right. From JR Kyoto Station, it is about 20 minutes (220 Yen) by bus. From the bus terminal A-1 at the JR Kyoto Station Karasuma Exit, take the bus No.5 and get off at the bus stop called Sanjo-Keihan. 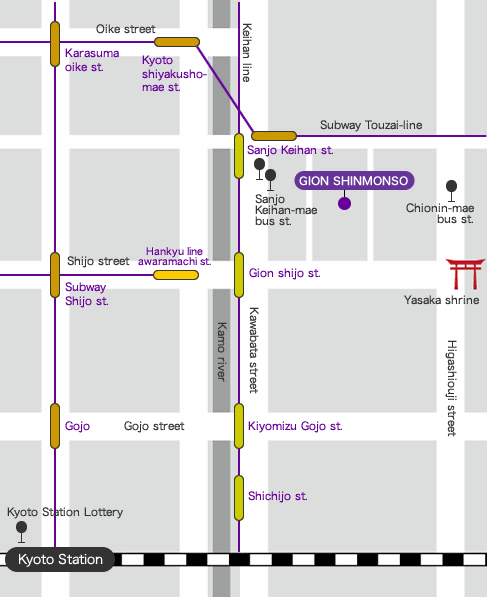 After getting off the bus, walk about 100 meters east on Sanjyo St. Take a right at the intersection onto Hanamikoji St., then walk about 200 meters south until you see " Gion Shinmonso " on your right. Walk west, then take a left turn. If you walk 3 minutes, you will find Shinmonso. Total traveling time: 47 min. Total traveling time: 43 min.